Today’s adventure takes place at Malin Head with one of Ireland's leading climbing instructors Bren Whelan, pictured above. Bren is an award winning wildlife & landscape photographer, film maker and highly qualified Mountain Instructor & International Mountain Leader. The day kicks off at Malin Head as my colleague and I meet Bren at the historic Banba's Crown, a Napoleonic Tower built in 1805. 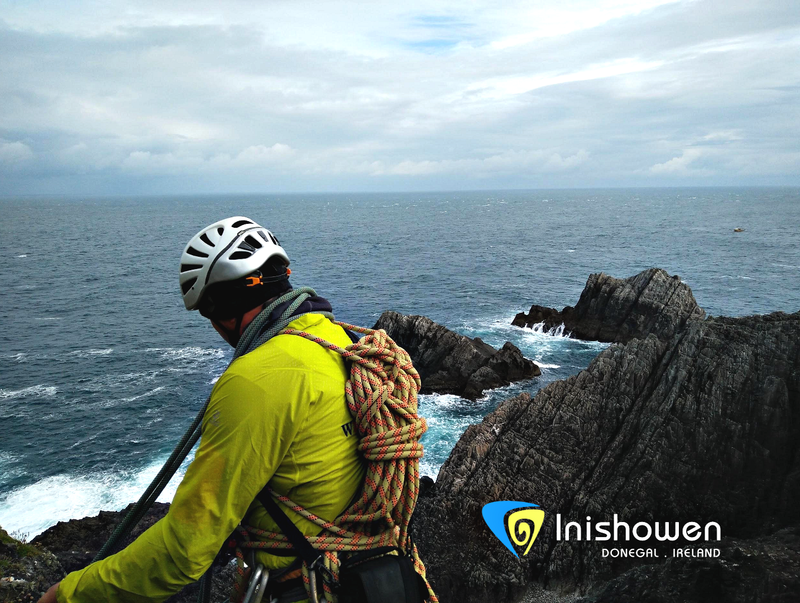 From there we make our way a little further along the headland to our climbing site, where we are fitted with harnesses, helmets and soft climbing shoes. 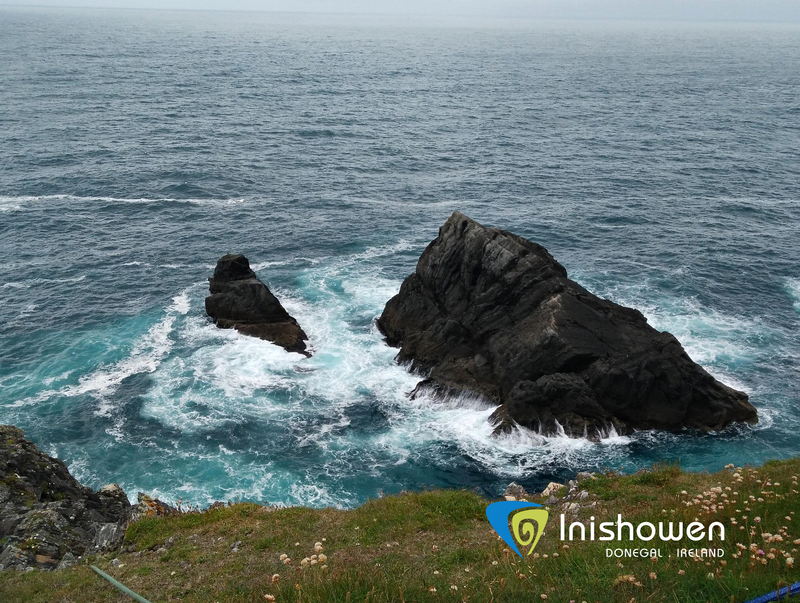 The scenery is simply stunning, the jagged sea stacks of Skildrenmore and Skildrenbeg strike up from the water, a temptation to climbers, but until July, home to nesting gulls. As a beginner, who admittedly is a little nervous of heights, Bren starts off with a gentle abseil over a grassy edge pictured above, that tumbles down to meet the stark rocky barrier between us and the Wild Atlantic. Using a multiple belay system, we complete a loop down to the foot of the rock face. 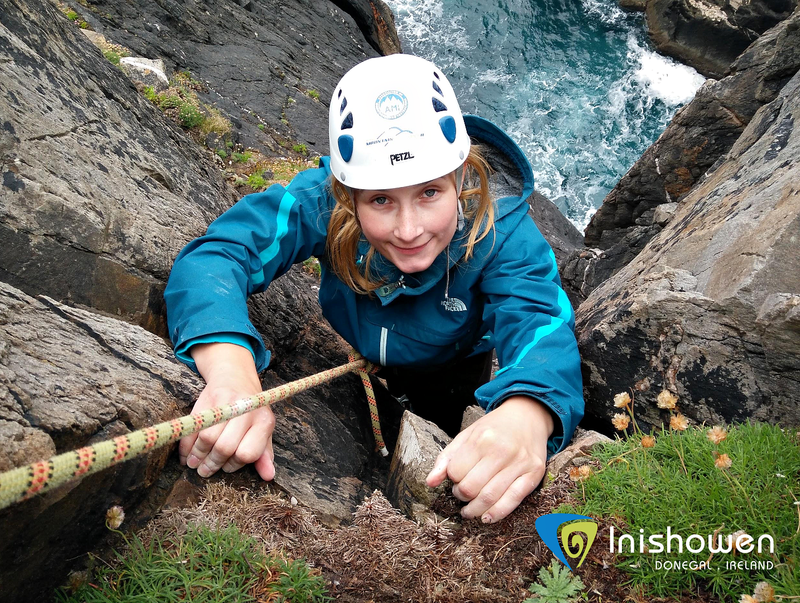 During the abseil you can hear the rolling sea drawing nearer behind you. At the bottom, standing on a thick bed of stones there is ample opportunity to pause and appreciate the raw beauty of our surroundings. Meanwhile Bren sets up the next belay ensuring the rope is attached to each cam and carabiner as he passes it. Ascending again, we learn more from Bren about the belay system, which keeps us all safe and connected. At each interval time is taken to ensure that we both know exactly what to do and expect. During the climb we hear some inspiring stories about his trips around the world and experience with climbing in all types of conditions. While the third belay system is set up, I find a seat on a flat rock on this outcrop, and take time to appreciate the experience - the multitude of colours; shades of green, blue and grey and the changing ocean is striking. Fear and Exhilaration at "The Cauldron"
The final belay takes us across a manageable walkway, perched atop a jagged ridge, and back onto solid ground. 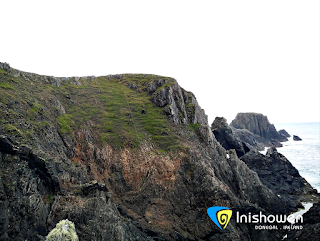 We stroll across to Dawson's Dihedral - named after Dawson Stelfox, the first Irishman to climb Everest. It's a dramatic site, the chasm plummets to "The Cauldron", as its aptly known locally. At this point you will find your knees buckling, but with guidance from Bren, a balance can be found between terror, determination and adrenaline. Before I begin my descent I coat my hands in chalk to improve grip on the rock face, I descend to where I feel comfortable and find a thin grassy ledge, pictured above, to capture a few photographs of this moment. Although still nervous I found a sense of calm standing there as the sounds of the ocean act as a reminder of where you are and how fortunate it is to be at this stunning location at the top of Ireland. The morning's climb not only helped settle my fear of heights, it was an educational and exhilarating experience, one not to be forgotten and certainly to be repeated. 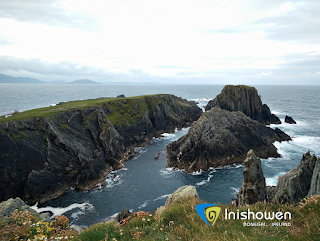 Aside from the experience itself, Bren takes time to point out some of the abundant wildlife in the area - the sturdy little pink orchids and the skylarks' with their territorial song.You will leave Bren's company with an appreciation for how he and others have been bitten by the climbing bug and by the draw of Malin Head's enchanting coastline, pictured above. Add any comments or questions below!